Our notification system has stayed virtually the same for the past decade and it shows. Notifications are basically just a bit of text, an icon, and some buttons. They don’t have any semantics, no description of what they’re actually about. I started a wiki page during Akademy collecting ideas on how to improve notifications in Plasma. The first feature that I implemented is the ability for applications to annotate a notification with a URL (or multiple URLs). The notification service will then show a large preview of said file (or a thumbnail strip in case of multiple files) which can then even be dragged to another window, e.g. to a webbrowser window, an email composer, a chat window, the desktop, anywhere you need it. This is again in line with our goal for Plasma, allowing you to fully immerse yourself in your current task without ever having to leave the application you’re working with. 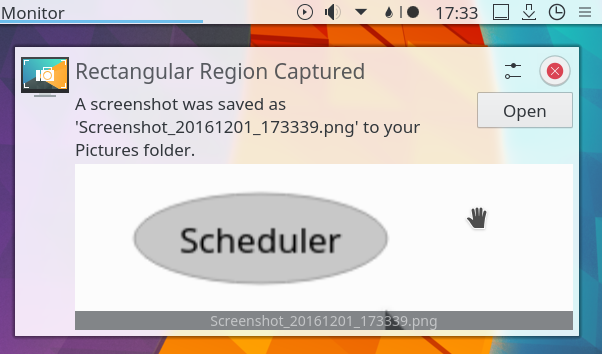 “Hey, can you send me a screenshot of that thing?” – Meta+Shift+PrtScr, select region, hit return, drag screenshot from notification to chat window, done. Easily number three on the list of most wanted features in Plasma (after Global Menu, scheduled for 5.9, and single Meta key press for opening the launcher, available since 5.8) is the ability to switch between windows and activate launchers using Meta + number keyboard shortcuts. One of the reasons this hasn’t been implemented in Plasma so far is that we’re infinitely customizable™ and you could have 23 task managers on 3 screens spread across 12 panels. The question is: which panel should own the shortcuts? Should the be spread, and if so, in what order? It’s complicated. Initially, I tried to take all of this into account, and created a 500+ lines of code patch that allowed you to designate which panel would own the shortcuts, hinting you that “Global shortcuts only work with one Task Manager applet at a time.”, and so on. This just wasn’t maintainable. The new approach is less than 100 lines, very simple, and basically asks the first task manager it finds on a panel on the primary screen (if there is none, it will look on all other panels) to activate the task at the given index. While this doesn’t give you full flexibility, it implements the majority usecase of having one panel with a task manager and all of that with very little code. It’s always a trade-off between code maintainability and implementing frequently requested features. If you like what you saw and you’d like to see more of it, please consider donating to our End of Year 2016 Fundraiser! A Notification Center, like macOS would be really cool. I was playing with it a while and it improves a dayli work + looks amazing. Now in the popup you have to scroll stuff and for example if you get few SMS notifications via KDEConnect, it looks like a mess. Something like this also came to my mind. Would this mean there’s a persistent history of notifications which can be managed through an application or what does “Notification Center” imply? Yes, some new special widgets would be good here. And also it would be good to have several configurable columns for panel, scrolling etc. How do you actually use meta key for opening a AppDash? I have used ksuperkey to set meta to Alt+F1 which is the shortcut for AppDash. I have no idea how to do it with the new Kwin thing. I created a forum thread but it has no replies so far. The following doesn’t seem to work in kwin file.